Today for us is the last day of Hanukkah, which for me is the first day I really concern myself with Christmas. It's a Saturday 2 weeks before Christmas though and I know going even to the grocery store will be unpleasant to say the least. When I was in my early 20's and just out of art school I worked in a place called " The Museum Company" in the middle of the hugest mall in New York's Capital District. We sold everything from reproductions of famous sculptures and fancy prints of Monet and Van Gough on giant canvases to things like "The Scream" printed on ties and key chains. As Christmas approached we stayed open later and later and hurried shoppers packed the store from "Black Friday" onwards. The worst days being Saturday and Sunday for the weary employees. The recycled air would get us all sick and my manager usually ended the season with walking pneumonia. For 2 years in a row I came in to work on Christmas Eve expecting more of the same madness of the previous weeks to be pleasantly surprised by the mostly empty store and a handful of dazed shoppers (almost all men with a panicked look in their eyes). When we lived in Argentina, the thing that impressed me the most about Christmas was that very little fuss was made until about 2 weeks before. There was no Thanksgiving, so Black Friday didn't seem to happen either. In Argentina planning things way in advance goes against their very beings. My kids used to get birthday party invites the day before sometimes. We shopped for Christmas ahead of time like we always did and even on Saturdays the stores seemed the same, not particularly crowded. Then we decided to pick a couple things up on Christmas Eve. It. Was. Crazy. Every store was packed and shelves were emptying quickly. We managed to buy a couple extra gifts and just went home exhausted! 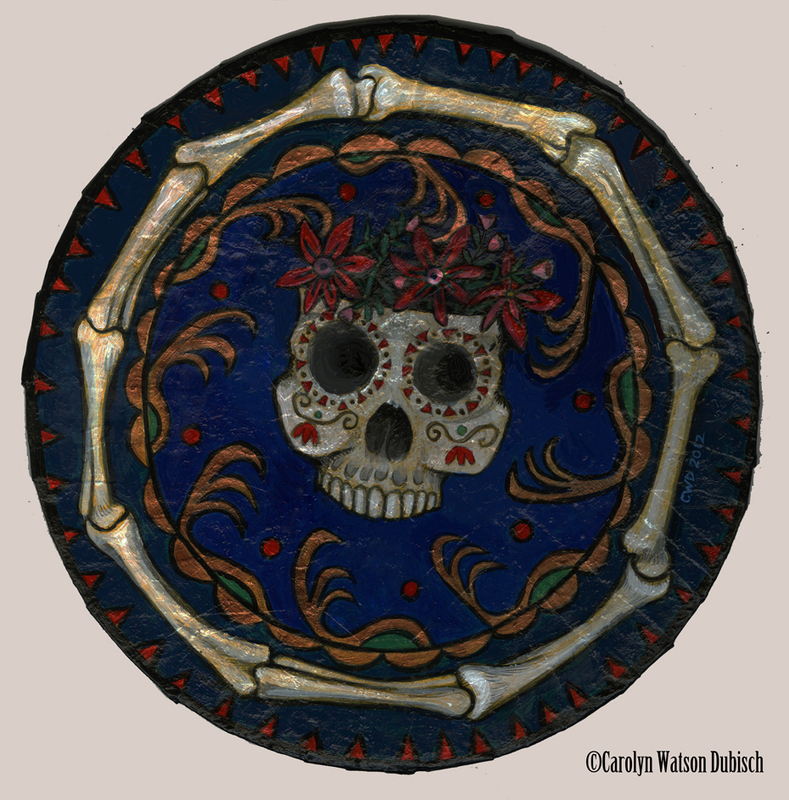 This "Day of The Dead" mandala wall hanging comes down today. 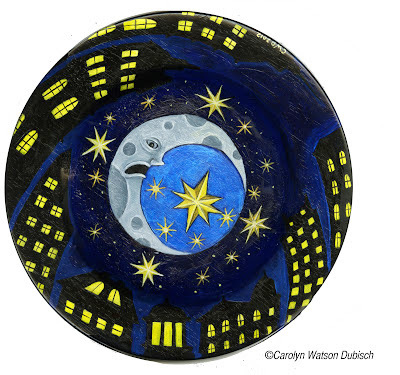 My "Moon and Stars" mandala painted on wood makes a nice gift. This is one of the watercolor illustrations from my children's book "Night of The Armadillos" being auctioned with a signed copy of the book. (More illustrations from this will be going up too). 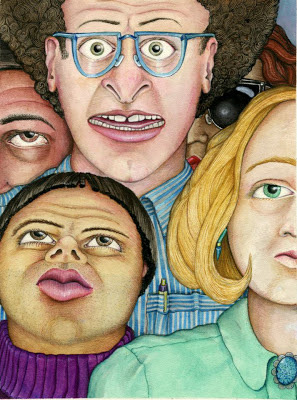 I'm also selling one of my favorite paintings "In The Elevator" -watercolor on illustration board.